The cooling fall air temperatures brings on renewed trout feeding activity in our interior trout lakes. Trout will feed on the few remaining chironomid and mayfly hatches of the season and then rely heavily on non-hatch food items. Fall fishing often means catching fish in very shallow water. Trout feed aggressively in an attempt to put on as much body fat before winter sets in. Let's take a look at 5 key food sources and representative fly patterns that should be in every flyfisher's tackle bag. I have found that the trout's urge to feed at this time of year means one can get away with simple or less imitative fly patterns. It is more important to fish the fly where the trout are and again, it is the shallow water zone that we should be focusing our attention on. Leeches are an extremely important food source during those last couple of months before freezeup. They are a big food item and no hungry trout will pass one up. Leeches are long lived aquatic worms that can be found living at almost all depths of a lake. It's always wise to fish leeches when you see them free swimming in the water. During the late fall period leeches will congregate in the shallow water zone of the lake. You will see them under logs, rocks and among the submergent vegetation. Predominant leech colours are black, brown, mottled brown and green and mottled black and maroon. I like to use plastic chenille woolly bugger type leech patterns during the fall. Plastic chenille is bright and flashes in the water. 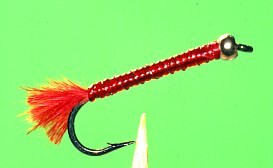 A palmered body hackle and marabou tail enhances the fly's motion when retrieved. A metal bead completes the fly by adding more flash and undulating motion. Remember, fall fish are hungry and flashy, noisy flies work. Many species of chironomids have more than a one year life cycle which means larval stages that must over-winter in the lake. These larvae can reach upwards of 25 mm in length. Predominant larval colours are maroon, red and green. 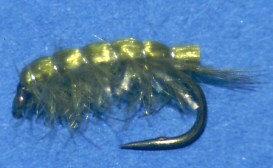 Chironomid larvae are a highly preferred late fall food item of trout. Maroon and red larvae are known as bloodworms. Larval patterns should have distinct ribbing to emphasize the segmented body of these worm-like morsels. I like to use body materials like Super Floss, Larva Lace, acetate floss and appropriately coloured yarns. Try ribbing your patterns with fine silver, copper or gold wires. Chironomid larvae have tiny prolegs at either end of their body, so you may want to use a small tuft of marabou as a tail. Begin fishing larval patterns close to the bottom and gradually work them higher in the water column. The retrieve for chironomid larvae is dead slow, much like the chironomid pupal imitation. One should never leave home without shrimp patterns. They are readily available trout food at all times of the year. However, in the late fall they become very important diet items as the name of the game is putting on body fat. Most of the interior lakes of B.C. have abundant shrimp populations. Shrimp live in the shallow shoal areas of a lake in amongst the bottom vegetation. Predominant colours are light olive to dark olive green. Shrimp seldom reach over 30 mm in length. Their bodies are covered with a semi-translucent chitinous exoskeleton that gives them the segmented appearance. Many shrimp patterns utilize a plastic or thin rubber shellback over a body material of seals fur or synthetic dubbing materials. When tying a dubbed body make sure you pick out fibres to form the swimmeret legs that protrude from the underside of the shrimp body. Don't be afraid to fish shrimp patterns tight to the shoreline or edges of cattail or bulrush patches. Hungry fall trout will not hesitate to dine on shrimp in water less than 50 cm deep. Interior rainbow trout certainly have a preference for immature damselfly nymphs. Damselflies can spend up to 3 years in the nymphal stage so it makes sense to have some patterns in your fall box of flies. I have found that trout will often eat very small damsel patterns so I tie them up on #12 and #14 shrimp/pupae hooks for fall use. Look for the damselfly nymphs on shoals that have abundant bottom vegetation and emergent vegetation like bulrush patches. Fish these patterns on floating and intermediate sinking lines from just subsurface to right on the bottom. Each lake will have their own colour variations of damselfly nymphs. Most common colours are all shades of green and brown. 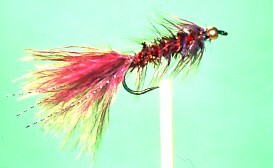 Marabou feathers are an excellent material to tie damselfly nymphs. For added fly action try tying some patterns with small metal bead heads. The bead will give the fly more action as it drops through the water and the flash of the bead can be a great strike triggering mechanism. Damselfly nymphs are best fished on floating and slow sinking fly lines. A moderately slow 8 to 15 cm long strip retrieve interspersed with short pauses is effective for imitating these insects. These air breathing beetles engage in swarming and mating flights during the fall months. Telltale signs of their arrival is the appearance of large raindrops hitting the surface of the lake on bright sunny days. The Boatman are returning to the lake to deposit eggs. Upon hitting the surface of the water they dive down to the lake bottom to deposit eggs. 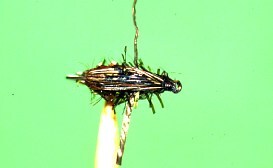 These insects can hit the water anywhere on the lake so anglers must be prepared to fish them mid-lake and in water less than one metre in depth. Boatman envelope their abdomen in a bubble of air before they dive down into the water. This gives them a very silvery appearance which could be a major feeding trigger for trout. Fly tiers should keep this fact in mind when selecting tying materials. Boatman also have an elongated pair of legs that propels them in an oar-like fashion though the water. 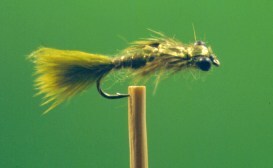 Try patterns with elongated rubber legs protruding from the sides of the fly. Boatman falls are best imitated with either full sinking lines to imitate the dive down and swim back up in deep water or floating and slow sinking lines for shallow water activity. 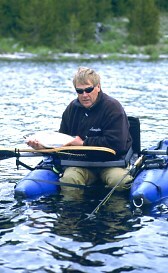 Keep your retrieves short and erratic and hold on tight to the rod as strikes are often very hard. Take a look at Phil's Fly Box for some other excellent stillwater patterns. Enjoy the fall season, it is short but offers some of the most exciting fishing of the year. For more information on fishing BC's lakes in Autumn, be sure to read Understanding Fall Fishing by Brian Chan.